It's summer time so the Little One is in need of some shorts. When I saw these at the local Gap, I new I had to make them. Off to the sewing table I went. 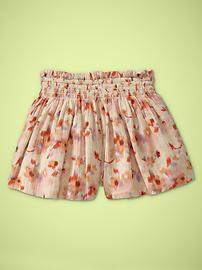 In under 30 minutes I had a new pair of darling shirred summer shorts that is sure to please. The Little One loves how they are so light and airy and I love how quick and easy they were to make! Click below to expand the entire tutorial! Here's what you will need..
Do the same for the back panel. The pants I used to trace my pattern from were form fitting, and the shorts we are making are loose and almost skirt like. So we are going to have to add some inches to the sides of the pattern. I noted on my pattern to add 4 extra inches to the side. I also wanted to have a thick shirred waist band like the pair of shorts from Gap. To allow for that, I noted on my pattern to add 2 1/2 inches to the top. Next, we are going to draw your pattern onto your fabric using a fabric marker. Fold your fabric in half (you will want to cut two of both the front panel and the back panel). Place your pattern on your fabric. Measure four inches from the long straight edge of your pattern, and mark on your fabric using a fabric marker. Next, to allow for the thick shirred waist band, measure 2 1/2 inches above the top of your pattern and mark it on your fabric using a fabric marker. If you want to add length to your shorts, now is the time to do it. Simply add extra inches to the bottom of the pattern. Trace around the rest of the pattern and cut out. Make sure you have two of both the front panel and the back panel. Now, let's get to sewing! You will first sew the front and back seam of your shorts. Place your two front panel pieces right sides together. Sew along the front seam (it is the curved part of the shorts below, I marked it in red). Do the same for your two back panel pieces. Now you have two front panels sewn together and two back panels sewn together. Put the front of your shorts on top of your the back of your shorts with right sides together. Pin the inseam together and sew in place. Stitch the outside side seams together. Time to head to the ironing board to fold down the waist band. With your shorts still turned inside out, fold your fabric over 1 inch. Press. Fold your fabric over once more about 2-3 inches. (or longer or shorter, depending on how wide you want your waist band to be.) I made my waist band about 2 inches wide. First, wrap your elastic thread around your bobbin. Don't do it too tightly or too loosely. Wrap it just so it is a bit taught. Place your bobbin in your machine like usual. Lengthen the stitch length on your machine (on my machine, I set the stitch length to just one notch shorter then a basting stitch). Turn your shorts right side out. With the right side of your shorts facing up (you want the elastic thread on the inside of your shorts) sew a seam 1/2 inch from the top of your shorts. Sew another line 1/2 inch below the first line. You will want to gently stretch the elastic from the first line as you sew. Sew 1-3 more lines as you just did until you have sewn 1/2 from the end of your waistband. To finish, simply hem the bottom of your shorts. To do this, turn your shorts inside out and fold the bottom edge of your shorts 1/2 an inch and press. Then fold down another 1/2 inch and press. Sew the hem in place. She's oh so ready for summer! http://jesscarleton.blogspot.com/2012/07/jammie-shorts.html Thanks for the tutorial, I used parts of it, photos are so helpful!